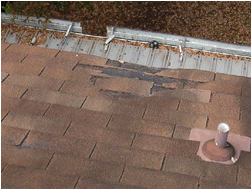 Severe wear, curling and degradation of roofing shingles at. Roofing material at end of useful lifespan. Per current accepted trade practices a chimney greater than 30” in width at the roof should have a cricket at the back side to prevent water penetration. 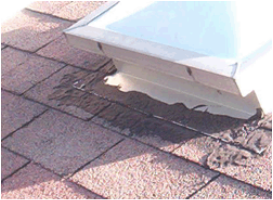 Improper construction and installation of flashing material may be expected to contribute to roof leakage points. Improperly installed drain vent boot on roof. Recommend evaluation by licensed, qualified roofing contractor. Damaged shingles from tree rub. Per current accepted trade practices, gutter downspouts that discharge onto the roof should be extended to the end of the roof line or into other gutters. Heavy tree overhang on roof.